Check out this week’s Room Makeover! We’re super excited about this transformation for so many reasons, but mostly because the reader who submitted the before pictures has become one of our favorite people on earth! From Seattle, she lives in a gracious house (in a stunning neighborhood!) whose living room kept her stumped. Like so many of our readers, who in the world has time to focus on interior design when you are a mother, wife, and are watching your career soar at the same time? It was our privilege to help such a wonderful person! Check out the fun before and after pictures, and every detail behind this fabulous space. This is one of the most talented families we have ever come across! The mother, an accomplished artist/graphic designer and brilliant business mind, has adored her talented musician husband for decades. They have two precious children who take after their parents – their son is a decorated soccer player and their daughter is a phenomenal dancer. They love to hang out together laughing and playing music in a room without a television, so how do you create a space that will appeal to everyone? For this Room Makeover, we designed an artistic living room that played off the family’s creative personalities by highlighting their love of art, music, and sports through bold accessories and very personal touches. The mother of this family adores the color orange (she says it’s her signature color). Check out her logo. She designed it – there’s big talent coming out of this fab lady! Orange, persimmon, and reddish tones pop throughout the pillows, side chairs, and inherent notes in the wood of the room. To let this hue shine without any distractions, we kept the other finishes neutral yet fabulous – our focus was texture and pattern. The sofa’s yummy, faux velvet makes soft (and forgiving!) seating for the family and their guests to enjoy, while the sleek mirrored finish of the sideboard, glass coffee table, and acrylic mirror offer a modern, reflective contrast. Graphic linen fabric on the wingback chair packs a punch without competing with the other patterns, and lightweight linen curtains complete the space with a simplicity that allows the room’s artwork and accessories to steal the spotlight (we’ll get to those in a second!). This house has original mahogany millwork in every room, so instead of paint, we opted for a light cream and white zebra-inspired print wallpaper. Despite its neutral palette, this wallcovering lends powerful visual interest that both balances and updates the millwork. Now the walls have enough presence to keep the wood trim from being a graphic distraction. Had we used a deeper color paper or paint on the walls, the room would have seemed dark. We wanted to keep this space light and fresh while “tempering” the mahogany and this wallpaper accomplishes exactly that! Because of the mahogany’s powerful presence that evokes a distinct era, we curated minimalist interpretations of traditional furniture that would complement and update the vibe of the millwork. The sofas’ curved frames soften the layout and anchors the room with loads of seating. And because this pairing really fills the space by the fireplace, we chose a glass coffee table, floating game table, and mirrored sideboard to round out the space while feeling “barely there” in their reflective and transparent surfaces (this is one of our design favorite tricks!). To provide extra seating in the room, we placed an armchair and fantastic drum table by the front window – her favorite place to sit! The side chairs (that are upholstered in their original tomato red silk) are vintage finds she found with her husband – a charming story of antiquing and their fun marriage! We loved the chairs’ profiles and the extra seating they provided by the game table, so we found something similar for readers which we covered in a striking and timeless flamestitch fabric. The couple inherited the stunning, curved corner cupboard ((swoon)), but we found an alternative for anyone who may not have one of their own. And by including the trunk, we added extra storage for boardgames or instruments while rounding out the other back corner of the room – Stylish Function, boop! All of the accessories in this living room reflect the cultured lifestyle and taste of the family. The father’s love of music is reflected in the musical score art we placed across from the fireplace anchoring that side of the room. A funky crumpled ‘sheet music’ paperweight, a sterling silver bowl filled with vintage guitar picks, and instruments placed throughout the room help anyone know a musician lives here. Even the rug seems reminiscent of a musical score. As for the mother’s design background, we displayed her own artwork (you can find her prints and painting for sale in the buying guide!) We also played up her style with a colorful pantone tray and vintage paintbrushes – down to the art books – everything is thoughtfully selected and lend a creative vibe. To honor her love of orange, we chose flowers and pillows to give splashes of the cheerful color that mimics her sunny disposition – we even chose a flowered pillow that almost has a hand-drawn quality like her black and white prints and a silk pillow that looks like drops of watery pigment dyed the fabric! Creating a sentimental piece for the family, we bronzed a pair of the daughter’s ballet slippers and placed them on the sideboard on top of a Degas dancer’s book. And we could not forget the wooden soccer ball puzzle as a nod to the son’s achievements! This living room’s layout was a tricky one! The off-center placement of the doors, uncentered location of the sconces, large corner cupboard, and the requirement that a comfortable chair be by the front window, made us think outside of the box. The first thing we did was relocate the corner cupboard. Now that beautiful wood is opposite the fireplace and feels more balanced! We echoed the corner cupboard by placing a higher wingback by the window across the room. And since a chair was required by the window, a sofa pairing seemed logical since more large chairs in the room would have looked odd. With no recessed cans in the space, the only ‘fixed’ lighting was off-centered sconces. In the end, moving one of the sconces a few inches was necessary, but we love how the new pair of bold sconces speak to the pair of floor lamps that flank the fireplace! A slick, nickel floor lamp and modern twist on a marble table lamp ensure every corner of the room is well lit. Stunning! Our biggest wish is that you get to experience the thrill of designing gorgeous rooms without the worry of design missteps. We all want a pretty house that reflects who we are and how we love to live – now it’s so easy. The floor plan in your house will likely be different from the one pictured here. That’s not a problem! You can reconfigure everything from the Living Room for the Arts in your own space. Our Design Guide and Buying Guide outline how to easily recreate this room in your own home. 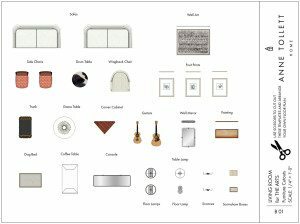 We always include complimentary 1/2″ scaled cutouts in our Design Guides for free, but if you would rather have 1/4″ scaled cutouts, here they are! We hope this space inspires you to create a room that reflects your own talents and passions. Nothing is quite as wonderful as a room that echoes the people who live in it! And to the dear reader who reached out to us, we have loved every minute of designing this room for you and your wonderful family! You are a treasure, and we hope your new room sets the stage for someone else to recreate this look in their own home. Big Cyber Hugs from the team at Anne Tollett Home.